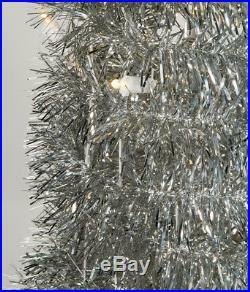 7’Hx17W Tinsel Pop Up LED-Lighted Artificial Christmas Tree w/Stand -Silver. Please note we cannot under any circumstance sell you less than 1 pack! Looking for something else? Beautifully made, this tinsel pop up led-lighted artificial christmas tree w/stand is perfect for any upcoming event or home and office decor. High quality colorful trees which can be displayed forever with no maintenance required. This listing is for 1 pack. You will receive 1 item per pack, 1 item shown in picture. Height – 7′, Width – 17. Lights – 100 LED clear. Includes shown decorative plastic stand. Please note the definition of the word “SILK” in the title or description, if used, does not mean the item is made out of silk. Silk flowers, silk plants & silk trees were named this over a hundred years ago when they were originally sewn with silk. While we still label them as “SILK”, the current manufacturing methods use synthetic fibers and high-tech processes to create botanically accurate, realistic reproductions. Unless otherwise stated, all measurements given for any potted item are measured from the bottom of the pot to the outstretched tip. This simply means if you point the longest leaf or frond straight up, you measure the furthest most measurement. Anything that is not potted is measured from the bottom of the stem to the tip of the furthest point. Any other items are always outside measurements, taking the tallest or widest measurement possible. Floral arrangements are more exact as these are pre-arranged and do not change shape after being created. Welcome to Silks Are Forever, one of the largest online retail and wholesale distributors in the United States for artificial silk flowers, silk wedding flowers, silk plants, artificial trees, artificial palm trees, silk greenery and silk garland. Open to the public, our customers range from small wedding planners to multi-billion dollar corporations. We offer quality products, unmatched selection, competitive pricing, and the peerless customer service that you’ve come to rely on over the years. We have close relationships with importers from China, Thailand, and other countries who keep our warehouses fully stocked with exceptional products that exceed the expectations of our customers. We’re able to offer you direct pricing because we’ve decided to cut out all the middlemen to bring our products straight into your homes at a price that is fair and reasonable. It’s our philosophy, attention to detail, and dedication to customer service that has helped us grow to the level of success we enjoy today. We look forward to brightening your home or office, helping you find that perfect gift, and hearing you say Wow, they look so real! Do you offer any catalogs? No we do not. We have a current selection of about 12,000 items. Every single day there are dozens of items are discontinued and replaced with new items. A catalog cannot keep up with our inventory. Do you offer material or color samples? We do our best to represent the product by showing a picture of the exact same item you will be receiving. If you require a sample then you will need to place an order for 1 pack and then you may return them if they don’t work for your project. Can I break a pack and only order 1 item? If the item title and/or description of the item states’pack of… You also cannot mix and match colors of the same product codes to equal pack quantity. Can they be put outdoors? Although our products CAN be used as outdoor decoration, it is not advised to hang or leave the flowers, trees, and plants in direct sunlight for any significant amount of time. This includes direct sunlight coming in through an indoor window. Most of our products are made out of materials that will eventually fade like any other fabric when left out in the sun. Please note, however, that they will last longer if put in the shade or on a porch where direct sunlight isn’t a problem. Heavy rain and wind may also knock the fronds out of trunks or the materials may absorb rainwater causing items to look wilted and/or fall over. We do stock many product designed for exterior use. Although they do cost more, it’s up to you to determine whether the cost of replacing a silk tree every year or two is worth the cost compared to one that is designed to never fade or deteriorate outdoors. Outdoor and/or Water Resistant in the title = Usually a PVC material that won’t absorb water. Not UV resistant and will fade over time. UV-Resistant in the title = Usually but not always a PVC material with UV inhibitors that will delay fading for a minimum of 1 year. Depending on materials used will depend whether it will endure the ravages of rain and wind. UV-Proof in the title = Usually but not always a PVC material with UV inhibitors that will delay fading for a minimum of 5 years. Designed to withstand the ravages of sun fading, wind, rain, ice, snow, and people. How are your product heights or sizes measured? In keeping with industry standards, any flower, plant or tree that comes with a pot are measured from the bottom of the pot to the outstretched tip on the top. When we say an artificial tree is 6′ high we are measuring from the bottom of the container or tree trunk to the top of the tree, extending the longest leaf or frond as we measure. For hanging baskets, for example, the length of the artificial flower or artificial plant is the longest hanging stem measured when it is fully extended. When we specify that a plant is 37 wide we measure the plant with the leaves or stems extended to the sides. Shaping these plants and trees will reduce the size. Please note that plant and tree heights are approximate. As they are hand made taller plants may vary a few inches in height. Are your product made out of silk? Please note the definition of the word SILK in the title, if used for this listing, does not mean this item is made out of silk. Keeping to industry standards the word SILK is now used to describe that a flower or plant is artificially made and does not mean that the material used is silk. Materials used may depend on the quality and the final shape requirements of the flower head or leaves and may include but are not limited to polyester, nylon, PVC, latex, rubber, and silk. What’s the difference between standard and handwrapped silk? Most artificially made flowers can be classified as either being a standard silk flower or handwrapped. Standard silk flowers are the most common and vary from your common economical fake flowers to very realistic replicas. Handwrapped flowers, on the other hand, tend to all be very high quality and are usually assembled by hand. The easiest way to tell is that the flower and stem and made together, rather than a plug where the flowers goes into. This tends to make them more realistic, and also harder to cut due to the amount of wire used in the leaves and stem. How do I care for and maintain artificial flowers and plants? We recommend that artificial floral arrangements and artificial plants be dusted much the same as you dust your home or office. Most artificial plants can be wiped with a moist cloth if necessary. First test the plant with your tap water – remove one leaf from an inconspicuous portion of your artificial plant and rinse it with tap water then shake it out. After your have tested your leaf, the best thing to do is to take the plant outside and dust it with a feather duster. This will remove most of the dust and prime your plant for cleaning. Cover your pot and filler with plastic for protection from the water. Make sure your silk plant is on a clean surface near a water hose. Use the spray nozzle on your hose. Spray your plant thoroughly with a light spray. When you’re done, shake it lightly to get most of the water off and allow it to dry in the sun for a few hours. This is a good regimen to be done about ever 3 to 6 months. Between those times, we suggest that you use a good feather duster to keep your artificial plants looking fresh and new. Emails are usually replied within 24 hours, including weekends. Most times you should get an answer back within a few hours though. Your questions and concerns are very important to us and we will do our very best to reply back with a response as soon as we possibly can. Please just search your country. How long does it take for me to receive my order? Please note the following. We must be notified within 14 days after receiving your item. All items MUST be in original condition with tags. Exchanges are considered new orders and must be placed through our website. You must notify us within 7 days! Any requests after 7 days will be refused. Add to Favorite Sellers. Sign up to Newsletter. View more great items! This listing is currently undergoing maintenance, we apologise for any inconvenience caused. 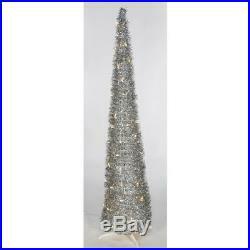 The item “7’Hx17W Tinsel Pop Up LED-Lighted Artificial Christmas Tree withStand -Silver” is in sale since Wednesday, September 19, 2018. This item is in the category “Home & Garden\Home Décor\Floral Décor”. The seller is “silksareforever10″ and is located in Cerritos, California. This item can be shipped to United States, Canada, United Kingdom, Denmark, Romania, Slovakia, Bulgaria, Czech republic, Finland, Hungary, Latvia, Lithuania, Malta, Estonia, Australia, Greece, Portugal, Cyprus, Slovenia, Japan, China, Sweden, South Korea, Indonesia, Taiwan, South africa, Thailand, Belgium, France, Hong Kong, Ireland, Netherlands, Poland, Spain, Italy, Germany, Austria, Bahamas, Israel, Mexico, New Zealand, Philippines, Singapore, Switzerland, Norway, Saudi arabia, Ukraine, United arab emirates, Qatar, Kuwait, Bahrain, Croatia, Malaysia, Brazil, Chile, Colombia, Costa rica, Dominican republic, Panama, Trinidad and tobago, Guatemala, El salvador, Honduras, Jamaica, Viet nam, Uruguay.